So as we speak we are currently on our journey through the 21 Day Fix. So far feeling great and I can thank our coach, Melissa, for all of her support and motivation. She is honestly way more than I could have ever hoped for! Although it is a bit difficult to get into the habit of measuring foods and prepping for the days ahead, she has made it a breeze. The other thing she made me realize, you don't have to cook boring meals! Here is one recipe that she shared with me that was so tasty, it was hard to believe that I wasn't eating a cheat meal! Check out this 21 Day Fix approved meal that is too good not to try! Bake at 400 degrees F for 30 minutes flipping the potatoes half way through. 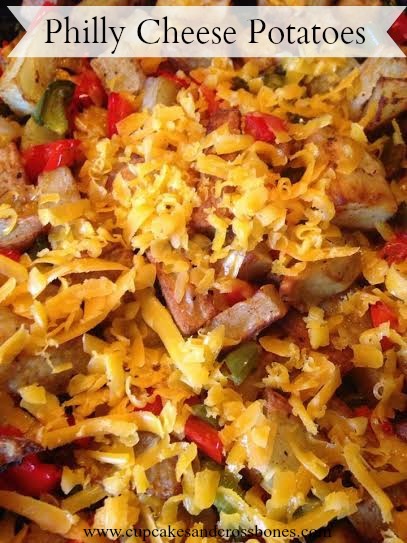 Remove tray from oven and top potatoes with cheddar cheese. and tell her cupcakes & Crossbones sent you. It is so good! It's an absolute must try! That sounds delicious! I'd probably use sweet potatoes.